(Alexandria, Va. — June 1, 2018) According to the results of a new survey by the International Parking Institute (IPI), technology continues to have a tremendous effect on the parking industry, whose scope goes far beyond parking cars. 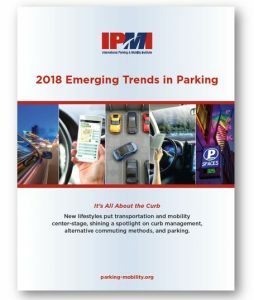 The 2018 Emerging Trends in Survey reveals that more than 60 percent of parking professionals surveyed now identify as “parking, transportation, and mobility professionals,” their jobs increasingly integral to design, management, and operations of parking that are part of the broader movement to ease traffic congestion and create more livable, walkable communities. Emerging as a top industry and societal trend is the importance of curb management in response to transportation network companies such as Uber and Lyft, which can put greater stress on pick-up and drop-off points. Those surveyed include professionals who design, manage, and operate parking and transportation services in cities, universities, airports, hospitals, sports and entertainment complexes, as well as industry consultants, commercial operations, engineers, architects, planners, and equipment and technology providers. The study reveals a profession whose responsibilities have continued to expand, often encompassing promotion of alternative commuting methods, sustainable operations, bike programs, traffic calming, transit, special events, technology integration, and data collection. According to the IPI report, more than half of respondents agree that perceptions of their profession have improved during the past five years. Although 40 percent see increased collaboration between parking, transportation, and decision-makers, answers also provided insights to why architects, planners, and contractors would benefit by working more closely with parking professionals. To view the survey results, download the report here.